clearly Enoch Powell was right when he proclaimed the result of the 1975 British Referendum on whether or not to substantiate Britain’s membership of the Common Market (subsequently EEC and then with no democratic vote nor authorisation by the victims of EU membership The EU [EUropean Union]), when he defined the decision as provisional – hence on 23-Jun-2016 the next Referendum is to be held. There is every possibility that because the peoples of Britain will merely replicate the mistakes made in 1975, that led to a narrow margin allegedly in favour of remaining members of the EU – then as now FUD was a major weapon used by the political forces to dupe the public. After the 1975 Referendum Edward Heath eventually admitted, in an interview by David Frost, that ‘he had deliberately lied to the electorate as he believed that if he told them the truth they would vote NOT to remain in the EEC’! Already we know that David Cameron and members of his team are deliberately telling lies to dupe the British public into voting to remain within the EU, starting with the lie that he has negotiated a binding agreement with the EU that gives Britain and the British a prefferential deal within the EU! The prime minister finds himself harassed by an increasingly eurosceptic party. In his heart, he shares the unease about Britain’s membership of the European institutions, but his head tells him that Britain cannot afford to cut itself loose from its own continent. The “outs” have the support of a significant group of ministers, including some in the cabinet. To put an end to the divisions and bestow new legitimacy on membership the freshly re-elected leader alights on a two-pronged strategy: to renegotiate the terms of the relationship with Brussels and to put the outcome to a referendum. The goal? To settle the issue once and for all. 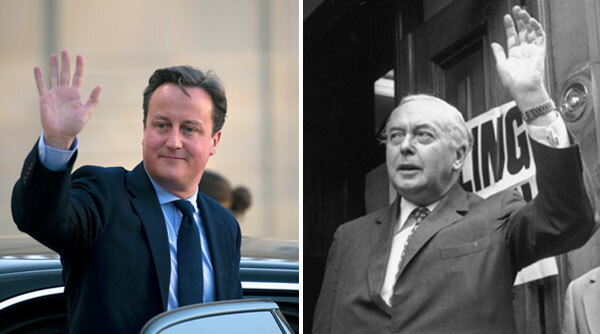 For Harold Wilson, substitute David Cameron. The world has changed since October 1974 when the Labour prime minister returned to 10 Downing Street promising to seek “reform” of the EU and then to allow the people to decide. The Cold War has ended, what was then a nine-state common market has expanded into the 28-member EU with a single market and, for the majority, a single currency. The rise of China and other new powers has remade the geopolitical landscape. Yet, as the following items from the FT archive show, the coming British referendum carries an unmistakable air of deja vu. For the two leaders, party management was the driving motivation. Both might be described as reluctant Europeans, but neither would have opted for a plebiscite if their hands had not been forced by rising unhappiness within their own parties. Cameron’s reform agenda has a different focus – Wilson worried about the cost of the Brussels budget and access for dairy products from New Zealand while his Downing Street successor has focused on regulation and free movement of labour – but the goal is identical – to claim they have won a fundamental revamp in the architecture of the relationship. Both, in this context, could be accused of selling snake-oil. Though dressed up as transformative, the reforms won by Wilson were at the margin; the same is likely to be true for Cameron. The timetables also have uncanny similarities: a general election manifesto pledge, a renegotiation scheduled to last about six months and a plebiscite soon afterwards. In Wilson’s case, Britain’s most important ally was Germany’s Helmut Schmidt and his most awkward partner France’s Valery Giscard d’Estaing. Cameron is relying on the support of Angela Merkel and fully expects a tough time from Francois Hollande. Enoch Powell, left, campaigned for a No vote and rejected the outcome as ‘provisional’. The Yes campaign, right, united Liberal Jeremy Thorpe, Conservative Edward Heath and Labour’s Roy Jenkins. Such was the advice of the Whitehall mandarins when negotiations got underway in November 1974. Schmidt was duly invited to speak at the Labour party conference and then joined the prime minister for a weekend at Chequers. The meeting, just before a summit of common market leaders in Paris, set the template for the diplomacy of the next few months. The Bonn government provided a bridge between Britain and more uncompromising partners such as France and Belgium. FT leader writer described Schmidt’s address to the conference as “masterly”. It is no accident that Cameron has been so assiduous in courting Merkel. A week or so later the Paris summit laid the groundwork for a deal to reduce Britain’s contributions to the EU budget. The breakthrough, as the FT’s common market correspondent reported, came after Wilson gave a public undertaking that he would recommend that Britain stay in the community if the right terms were agreed. This was part of the deal struck with Schmidt at Chequers, which would in turn lead to a final accord at the Dublin summit in March 1975. It would be surprising that if Merkel does not seek the same commitment from Cameron. Negotiations between the Paris and Dublin summits were far from smooth, with the French government often digging in against concessions. For Cameron the process is more complicated still – there are 27 partners instead of 8 to be won round to the British point of view. New members from eastern and central Europe, for example, will dig in against British demands for changes in the rules governing free movement of labour. Federalists in Belgium and Italy will resent the British prime minister’s disavowal of “ever closer union”. But the basic political dynamic may be the same: if Cameron can keep the Germans onside and Merkel builds a bridge to Paris, Britain will be most of the way to a broader agreement. Cameron will have to stay awake. In March 1975 the bargaining in Dublin ran into the early hours before leaders settled the toughest issues surrounding the budget and New Zealand dairy products. “We have taken the renegotiations as far as they will go and they are now over”, Wilson declared. Cameron’s hope is that he can secure better terms at one summit – in Brussels in December – but the betting among many diplomats is that, like Wilson, he will have to endure two sets of late nights, with a final package not settled until March 2016. Wilson may have said yes in Dublin, but seven senior ministers – among them Tony Benn, Peter Shore, and Michael Foot and Barbara Castle – dissented on his return. The vote in cabinet on the Dublin deal was 16-7. Wilson had anticipated the split by taking the unique constitutional step of suspending cabinet responsibility for the duration of the referendum campaign. The sceptics stretched the arrangement to the boundaries and sometimes beyond. One middle ranking minister was sacked for overstepping the terms of the deal. Cameron faces a similar dilemma about collective responsibility. Should he force cabinet ministers such as Iain Duncan Smith to resign if they want to campaign for withdrawal? For their part, voters will hear from the Tory right the arguments about reclaiming sovereignty made from the Labour left by Benn and others in 1975. Plus ca change. Agreement at Dublin was followed by a White Paper setting out the case for continued membership warning, as the FT put it, of the “dire consequences to the economy if the electorate votes for withdrawal”. A decision to leave would hit overseas investment, the balance of payments and employment. On the critical issue of sovereignty – the restoration to Westminster of which was a central demand of Eurosceptics now and then – the White Paper drew the important distinction between theory and practice. Britain, it said, was better able to advance its national interests within the community – this was the essence of sovereignty. Will backbenchers back a deal? When the House of Commons voted on the Dublin deal in April 1975 Wilson secured a comfortable majority of 226. But more than half of the Labour MPs who voted (144) backed withdrawal from the community with 136 behind the prime minister and 34 abstaining. Cameron hopes that more than half of Tory MPs will support him but, like Wilson, will rely on the votes of opposition Labour MPs to secure a parliamentary majority. However, the choice as Labour leader of Jeremy Corbyn, a long-time Eurosceptic, has jangled nerves in Downing Street. Margaret Thatcher may have ended her premiership as a champion of the Eurosceptics but she began it as a fervent champion of membership. Sharing a platform with Edward Heath for the first time since she had ousted him from the party leadership she insisted that the Conservatives would eschew party politics in the cause of Europe. Some might see the referendum as a way to see off the Wilson government but, as the FT reported, Thatcher put the national interest first: “We must play our full part in ensuring that Conservative supporters say yes to Europe”. When the final votes in the June were counted. The yes campaign scored a resounding 67 per cent against the 33 per cent garnered by the No camp. As the FT’s political editor wrote the victory would banish the issue from the centre of British politics. If only. While the pro-Europeans such as Roy Jenkins celebrated the antis on the left, the FT reported, declared they would accept the majority verdict. The leading anti-market campaigner Enoch Powell was almost alone in describing the result as “provisional”. The truce was short-lived. 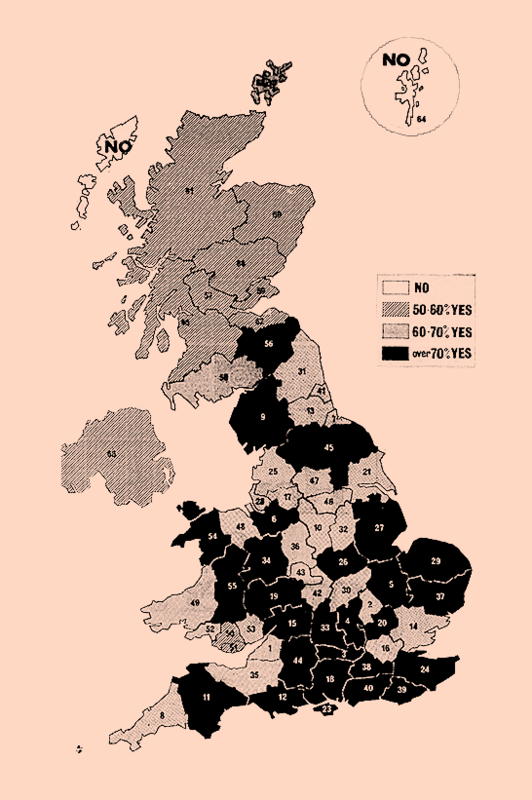 Labour’s defeat at the 1979 election saw the Eurosceptic Foot win the leadership and by 1983 the party was fighting a general election pledging to withdraw from the community. Jenkins and several of the other leading pro-Europeans broke away to form the rival SDP. It would take another decade – and the help of Commission president Jacques Delors – for Labour to reconcile itself to Europe. Thatcher had begun the long march in the other direction. By the time she was toppled by the pro-European Tories in 1990, the Lady had all but disavowed her earlier enthusiasm for Europe. The Eurosceptics would torture John Major and win a growing voice in the Conservative Party. Powell was proved right. So will a second referendum settle it? Unlikely. Previous Previous post: GP-BFB: Guido Fawkes And Matthew Elliot: Referendum Sharp Practices? Next Next post: Would YOU Espouse An End To Britain – For I Would Not!